There's no better way to start off your cast iron collection than with our 6Piece Cast Iron Set. The kit includes a legless Dutch oven with a trivet, a 10inch skillet, and a deep skillet with a matching lid that doubles as another skillet; you'll have all the cast iron cookware you need for your favorite meals in the kitchen, at the campsite, or on the back patio. With our True Seasoned Finish, you can get cooking with your cast iron right away. 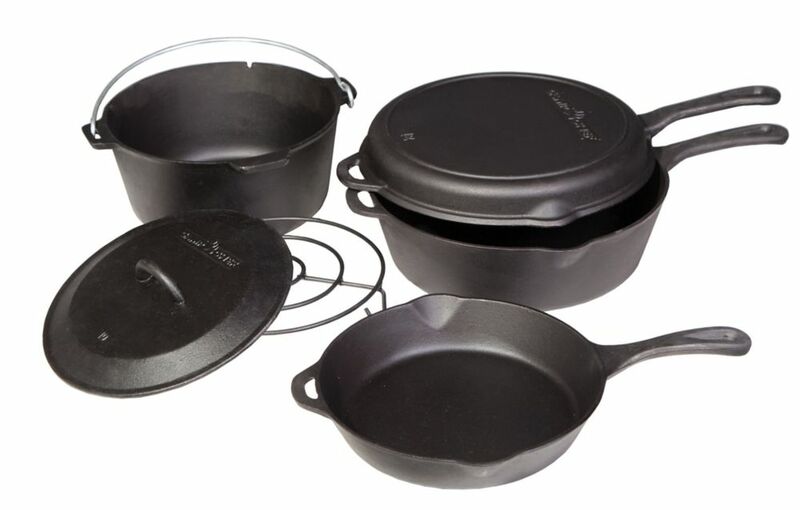 Enjoy superior cast iron cooking today with the 6Piece Cast Iron Set. Cook sausage and pancakes for breakfast and grilled burgers for lunch. Versatility and maximizing space is important when it comes to outdoor cooking and the Reversible Cast Iron Grill and Griddle can do it all. This cast iron grill/griddle heats evenly and holds heat well, making it easy to cook your food to perfection. Preseasoned with Camp Chef's True Seasoned Finish, this grill/griddle has a natural cooking surface that is ready to use out of the box. Complete your outdoor and home kitchen by expanding your menu with this cast iron pot set. Fry your favourite wings or create a delicious seafood boil anytime, inside or out. This pot set includes a 7.5 quart cast iron pot, lid, and handled basket making if perfect for French fries, stews, steamed vegetables, seafood and more. The pot comes preseasoned with Camp Chef's True Seasoned Finish making it ready to cook on out of the box. 6-Piece Cast Iron Cooking Set There's no better way to start off your cast iron collection than with our 6Piece Cast Iron Set. The kit includes a legless Dutch oven with a trivet, a 10inch skillet, and a deep skillet with a matching lid that doubles as another skillet; you'll have all the cast iron cookware you need for your favorite meals in the kitchen, at the campsite, or on the back patio. With our True Seasoned Finish, you can get cooking with your cast iron right away. Enjoy superior cast iron cooking today with the 6Piece Cast Iron Set. 6-Piece Cast Iron Cooking Set is rated 5.0 out of 5 by 2. Rated 5 out of 5 by Frank from Cast Iron Set This cast iron cooking set is fantastic the heat is distributed evenly on all surfaces, cleanup is a breeze oiling the set after each use will ensure many many years of use well worth the money. Rated 5 out of 5 by Anonymous from Best cast iron set around I bought this cast iron set yesterday in big 5 after your facebook live video and used the 12 inch skillet last night to cook up some delicious ribeye steaks. MY OH MY was it wonderful! Extremely easy to clean and it worked great. Thanks camp chef!